Today for Meaty Meatless Monday I want to do a bit of a tutorial/guide to cooking with Jackfruit rather than sharing a specific recipe (although I will definitely share some of my favorite recipes for it). 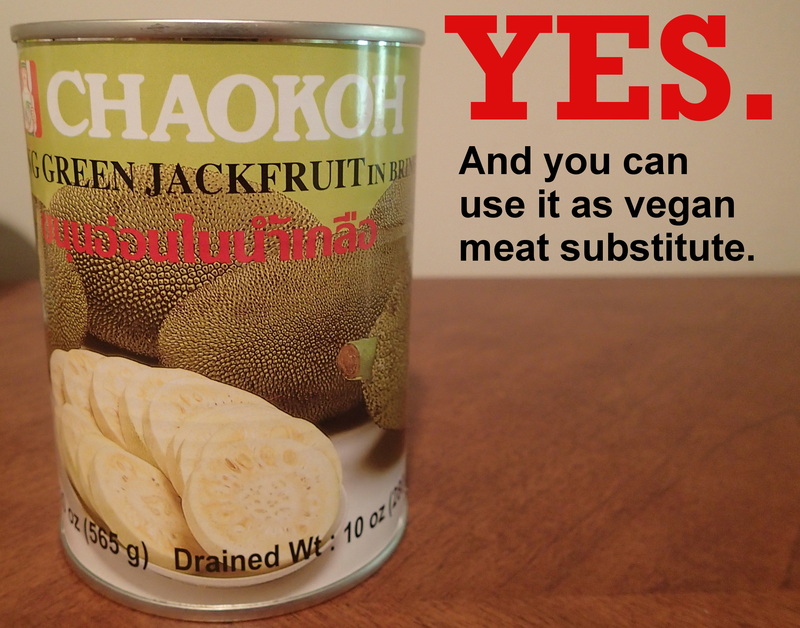 For those of you that don’t know, Jackfruit is a tropical fruit that is popular in regions of Asia, that happens to be, when in the right form, a fantastic faux meat substitute for vegans in terms of it’s texture. It can be used in vegan pulled pork type recipes, bbq, as a crab or tuna substitute, even in a recipe for Philly Cheese Steak, to name a few! It is rich in iron as a half cup has 25% iron, but otherwise has fairly neutral nutritional value. It is similar to tofu in that it can take on whatever flavors you cook it with, with a bit more of tangy, even sweetly sour taste. I jumped on the jackfruit wagon as soon as I could find a way to get some, and at first that meant purchasing it from Vegan Essentials’ online store. 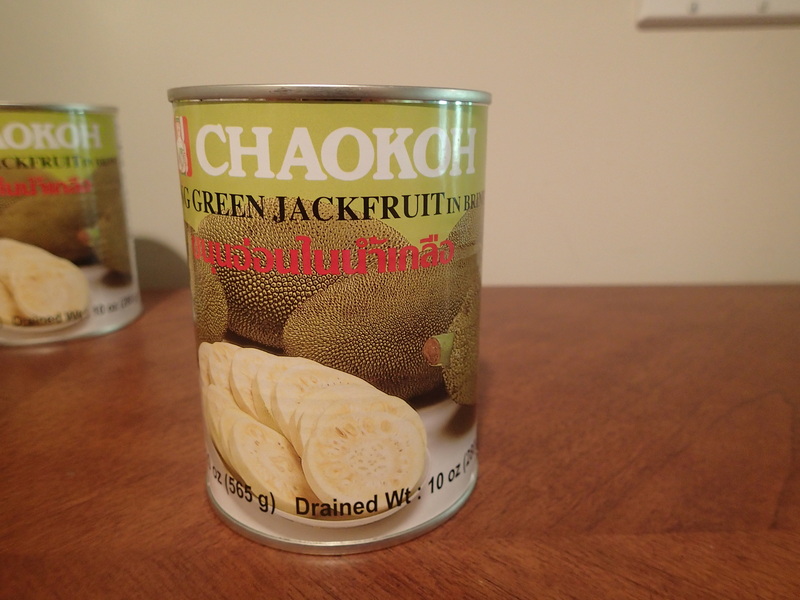 You can find a link to the actual jackfruit here. 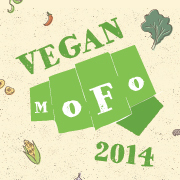 However, since every vegan I knew in my small state had said they couldn’t find it locally, I at first did not question them, and assumed the Asian Markets had been checked thoroughly since people had said they had looked there. Well, one day I decided to question that and see for myself. And low and behold, The Chinese American Mini Market in Cranston, RI had a big shelf of them, and they were less expensive than Vegan Essentials at $1.35 a can, as well as no shipping costs were needed. Hurray! This can still be used for other types of recipes, but won’t work if you want to make a shredded meat-like recipe. Notice that the can also says it is in syrup. When preparing the jackfruit, you typically want to drain and rinse it before using. The easiest and best way I have found to shred it is to pulse it a few times in a food processor. If you don’t have a food processor, then it’s a good idea to simply follow the instructions the recipe usually includes that asks you to shred it with a fork, either before or after it is cooked. Now, on to the recipes! In books, my favorite recipes using jackfruit are from Bake and Destroy by Natalie Slater. 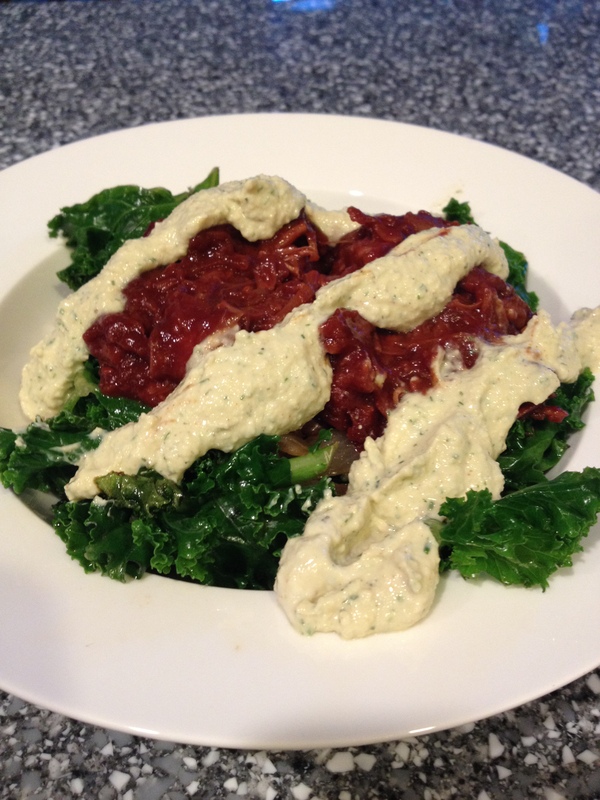 She has a recipe for yummy bbq’d jackfruit in the crockpot (which I believe is called Cannibal Corpse Crock Pot) that she also uses on top of a yummy kale salad. She also has a recipe for a sweet potato and walnut jackfruit hash (which she calls “You Don’t Know Jack Hash”) which I absolutely loved. Check her and her book out! 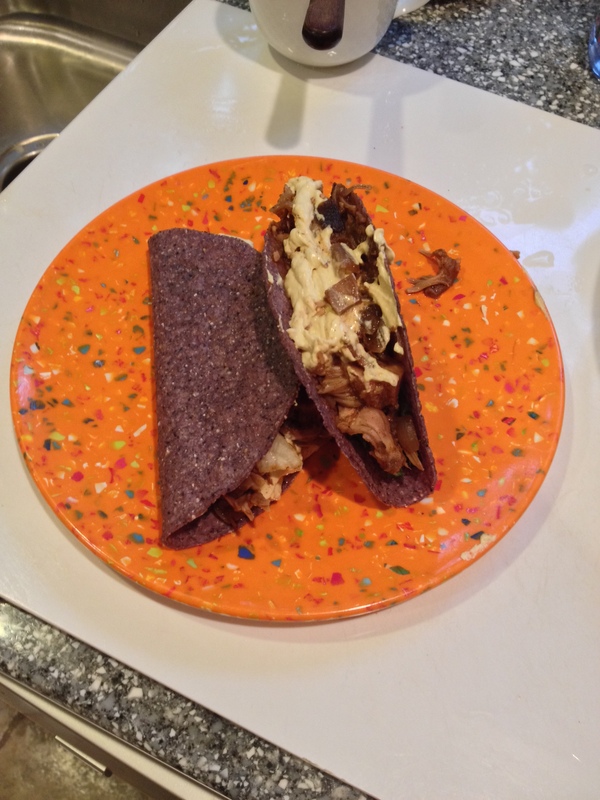 The Vegan Girl’s Guide to Life by Melisser Elliott also has a really great vegan carnitas taco recipe in it. 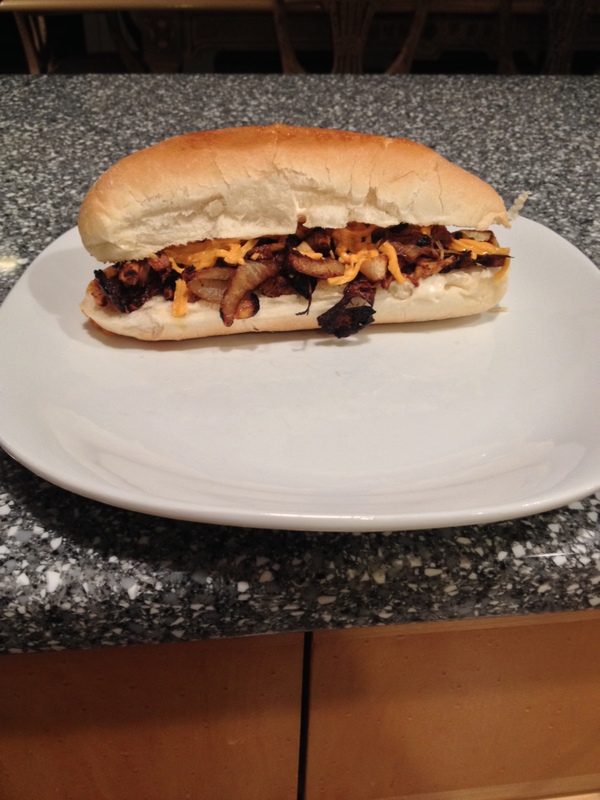 The V-Word (a fellow Mofo-er) has a mind blowing recipe for Vegan Philly Cheesesteak. Finally, one of my absolute favorite non-tuna salad sandwich recipes can be found here. It is amazing, and unfortunately gets gobbled up so fast every time I make it that I don’t have any pictures. It was a big hit by itself (without the melt part) at Girls Rock this past Summer amongst the volunteers! And how could I forget? 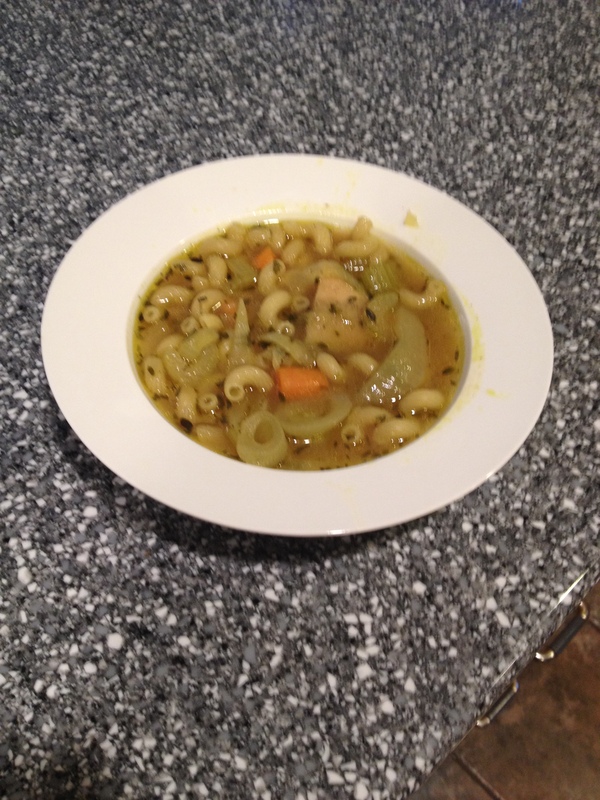 My very own Jackfruit Chick’un Noodle Soup! 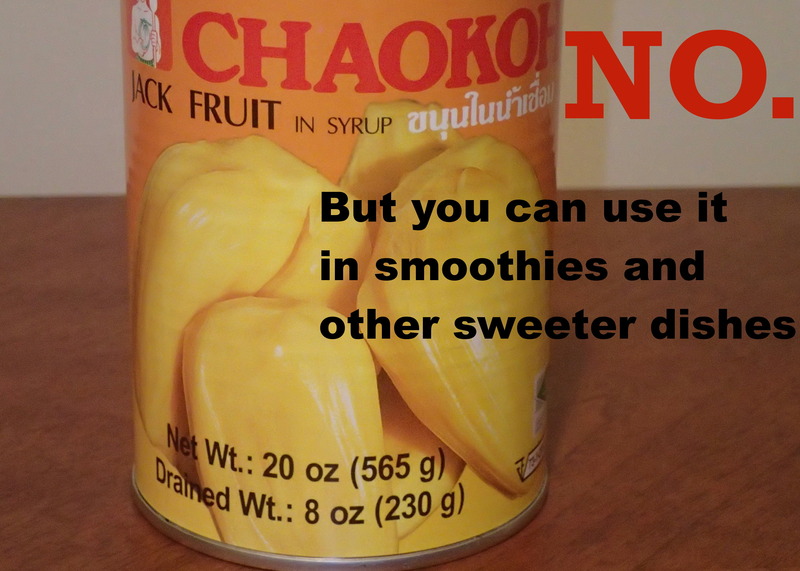 So, in conclusion, do not be afraid to try jackfruit. It’s really fun to use and delicious, and there are many recipes you can find. 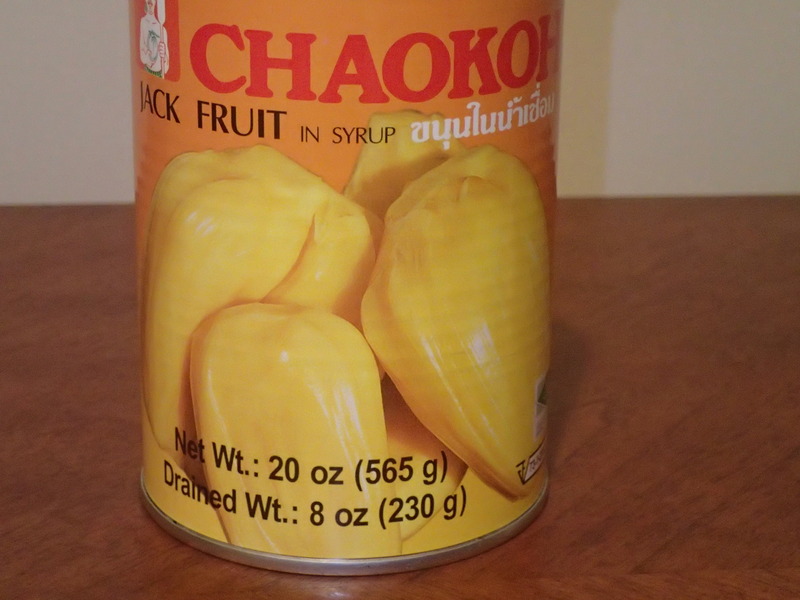 I hope this settles some of the confusion you might have had if you are a jackfruit newbie looking to find it and don’t know much about it, as well. Exciting news in my world! So I forgot to post my typical Friday entry, and had been so excited with some great news I received this week, that it must be why I forgot! But also, I wanted to write a special post about all the new things that are going to be happening! Second (there are 3 big things total to share), my recipe for the vegan “Scallops” Wrapped in “Bacon” was featured on the Bake and Destroy blog! I’m so honored to share my recipe there, and also so happy and proud the recipe came out so well! Here is the link to it, if you have not seen it yet!! Thirdly (and finally!) I got accepted into a culinary arts degree program! It’s at Johnson and Wales University, in Providence, RI (about a 20 minute drive from where I live!). My goal is to get my Bachelor’s degree in Culinary Nutrition (and maybe even become a Registered Dietitian when I complete it…but one step a time…) but I have to prove myself first by completing the Culinary Arts associate’s degree with a 3.0 gpa, and applying (with references and some volunteer or work experience in nutrition). I do not think it will be much of an issue, but we shall see! Either way I am very excited! Until next time friends! Keep eating deliciously! I went to a burrito place that had seitan as a filling option (which I was very excited about) in Amherst, Massachusetts, an Asian restaurant in Providence, RI (the menu had mostly Thai and Chinese dishes but also some Cambodian I believe) where I got orange crispy tofu, garlic eggplant, and sticky white rice, and then tonight to The Grange in Providence where I got a pretzel bun po’ boy with fried oyster mushrooms, vegan remoulade, pickles, lettuce, and cole slaw. It’s a big toss up between whether I liked The Grange or the Asian food better. I want to say I liked the Grange more. I was so excited when I was eating that sandwich. The flavors in it are amazing. And all the textures together worked really well. A mix of 3 crunchy elements (the pickles, lettuce, and mushrooms) and two soft/creamy (the bread and the remoulade). I was worried that the restaurant might not live up to the hype I’ve heard about it, but I was impressed by the food at least. The only complaint I may have but am undecided about is that I found the atmosphere kind of weird, it was noisy and too dark (I don’t really like dark restaurants, but maybe that is because my vision is not great in the dark? I honestly do not know! The Asian restaurant (called Gourmet House) had a lot of options for tofu which is always a sign of a good Asian restaurant for me. Almost all the dishes you could choose tofu or tofu and vegetables with. The orange tofu was so good. I was not expecting it to come the way it was though. This tofu was more like what I remember the sauces being when I was an omnivore and had ordered lemon chicken. 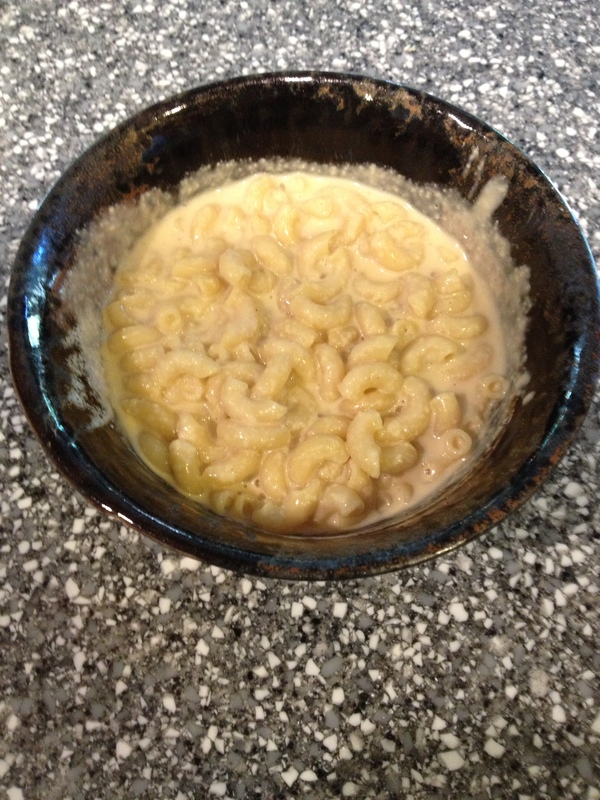 It was a thick, citrus-y orange flavored sauce, with no hint of soy sauce or anything that I was expecting. I liked it so much I may have gone a bit overboard by eating the whole plate of it. Oops. And the eggplant and rice were also very yummy. I liked the stickiness of the rice, I don’t think I’ve actually ever had sticky rice before. It’s kind of sweet. The eggplant was savory but also had a sweet flavor to it at the time. The eggplant itself melted in my mouth. Sorry I didn’t take any pictures of my food at the restaurants, I was embarrassed to do so, heh. 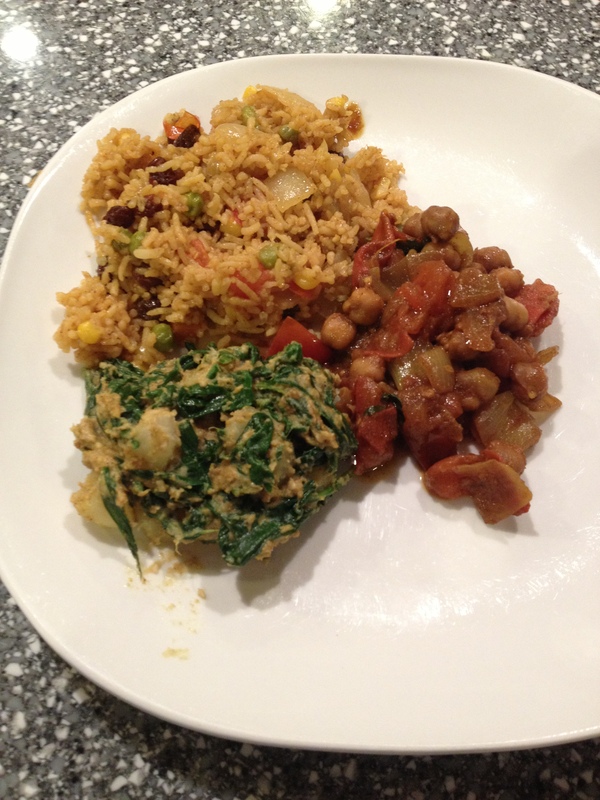 Anyways, on to what I made from some tasty recipes this week. 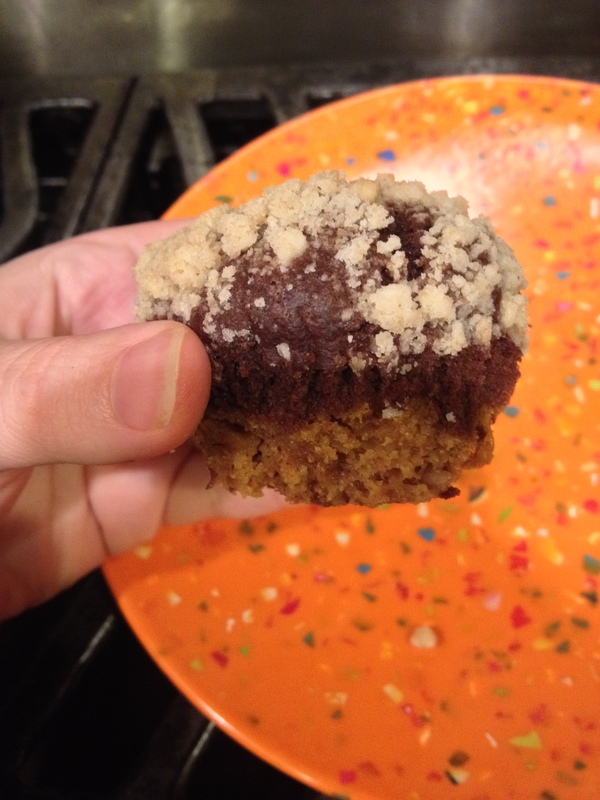 Venus Chocolate Pumpkin Muffins from Bake and Destroy by Natalie Slater. 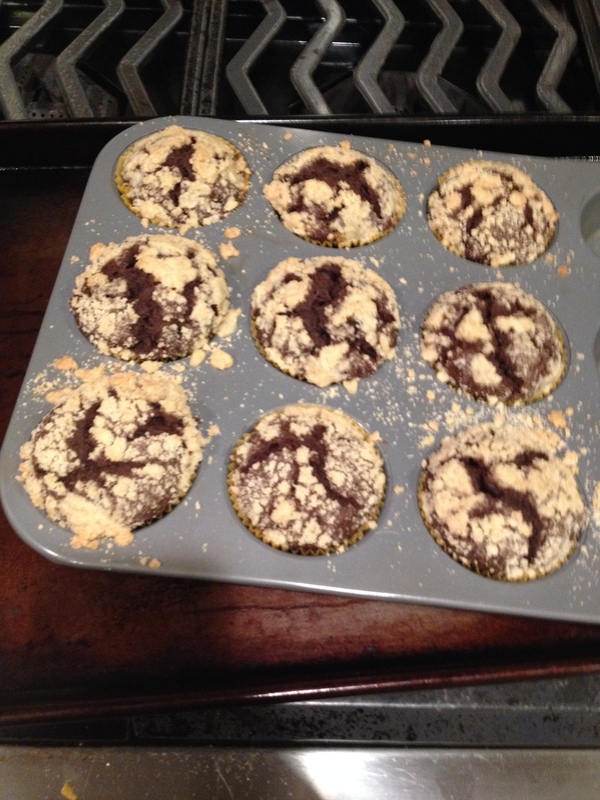 These are half and half pumpkin/chocolate muffins with a streusal topping. They’re difficult to make half and half so they look good, but they do taste pretty good. Next time I might omit the walnuts in the pumpkin, because I’d like a stronger pumpkin flavor. I think the walnuts might overpower it. Also I had a hard time with my oven getting them cooked well enough. Even with the max time listed with the recipe they were still totally liquid in the middle when I put a toothpick in the center, I think I cooked them for 5-10 minutes more. I honestly cannot remember, sometimes my oven is a bit weird lately. Overall, these tasted pretty good and the recipe was pretty straight forward and easy despite having to make 3 separate parts so I give it a 4 good banana, one bad banana. It lost one good banana because it just didn’t have that “wow” factor when I tasted it. But they’re good otherwise. Second, was Tofu Satay from The 30 Minute Vegan cookbook. 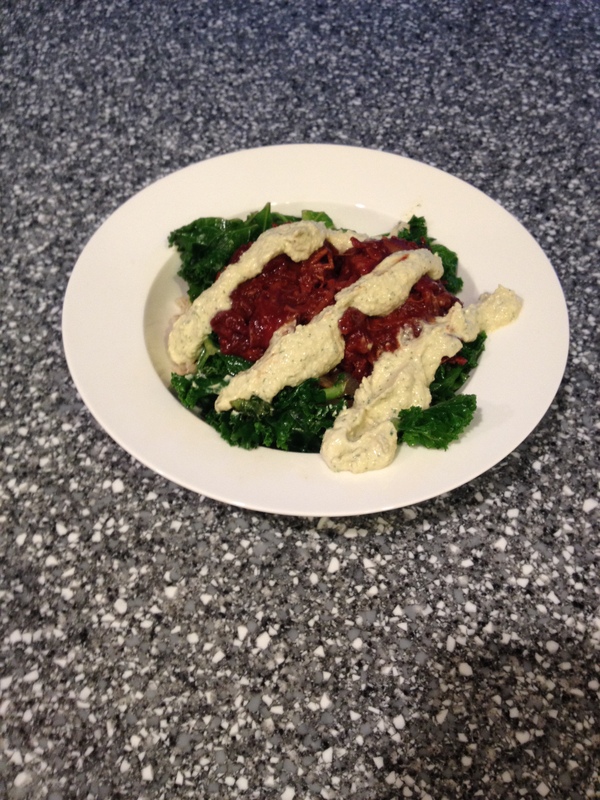 I made it into a bowl with some quinoa and added extra peanut satay sauce on top. The satay sauce was perfect, it tasted exactly like the kind of peanut satay sauce I like, that I remember getting from the Thai restaurants I have been to. Sometimes people and companies make a type of peanut satay that doesn’t taste this good, maybe without coconut milk and less of a peanut buttery taste, but this was amazing. The tofu came out pretty good, but I wish I had baked it longer until it got a little more crispy, except I was hungry and impatient so oh well. 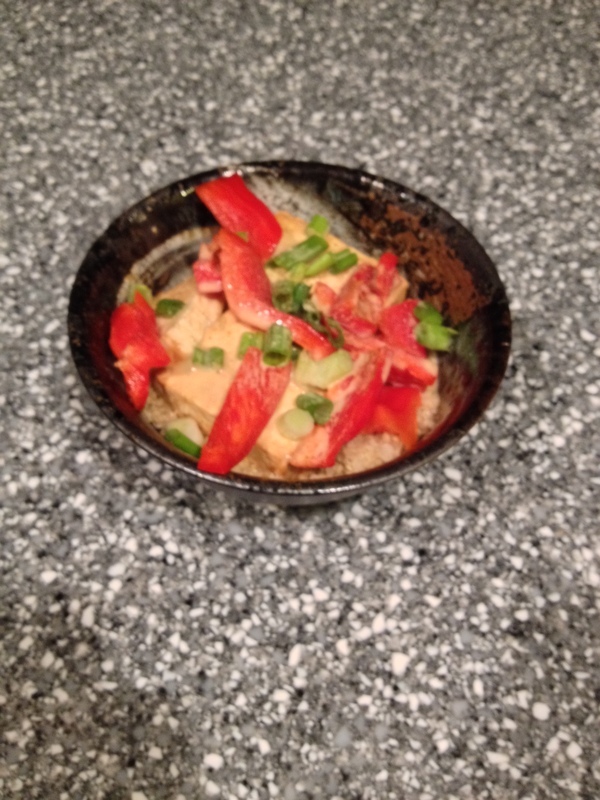 The addition of raw scallions and red pepper made it a complete and tasty meal all together with the quinoa. So yay! I think this probably deserves a 5 good banana rating! That’s all, folks! I have some couple neat ideas for a few different kinds of posts this week, hopefully I’ll get some time to post them, but I do have some exams coming up as well, so I don’t know! But I hope so!